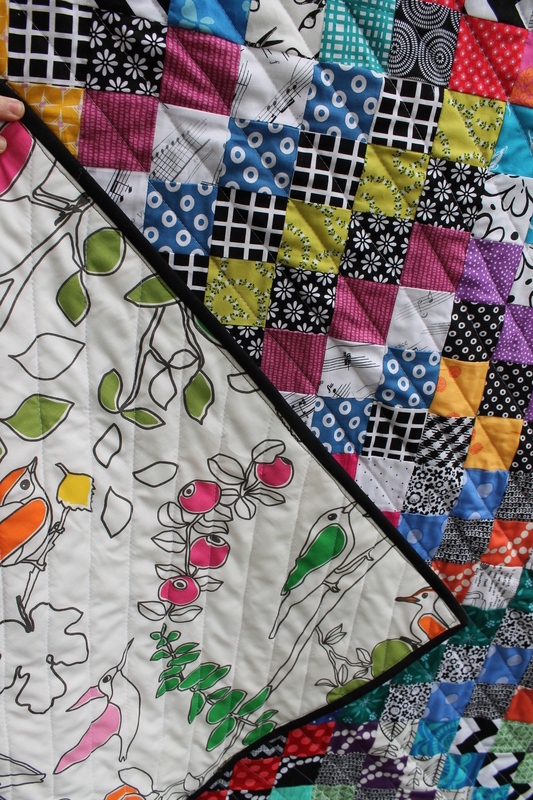 Like a lot of quilters out there, I have been seeing Trip Around quilts and blocks on-line for ages and ages. 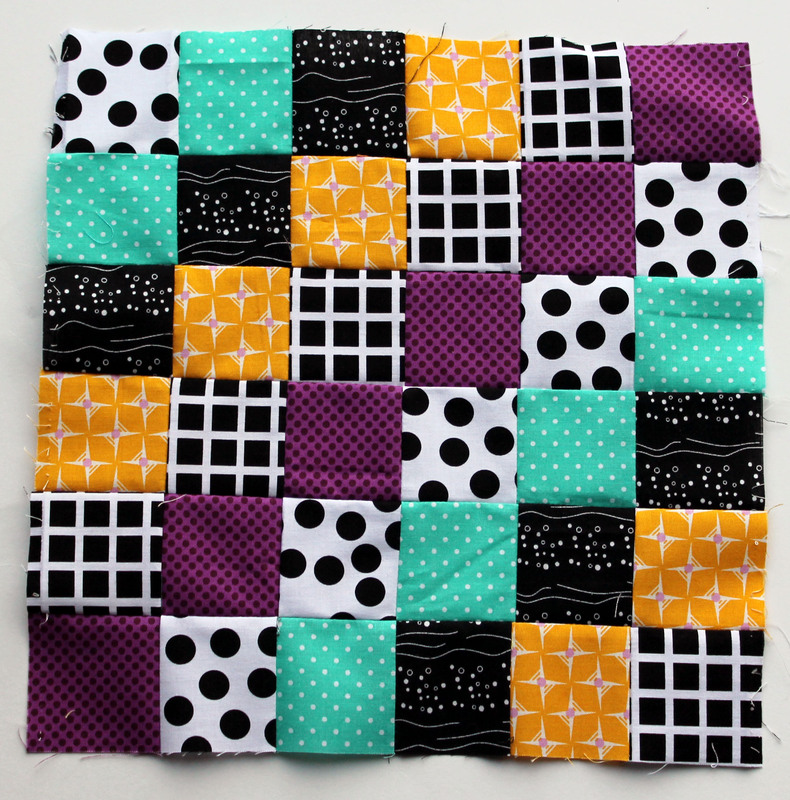 I had seen some amazing versions but I had never really thought about making one myself… then the Portland Modern Quilting Guild set it as one of their charity blocks. That is when the trouble started. First I checked out the pattern instructions from Bonnie Hunter at Quiltsville. Looked easy enough. My initial intention was to make just on block for the charity quilt so I cut 6 strips of fabric and made this. What was not included in the instructions was how addictive this process was. My one block very quickly and easily grew to be this. 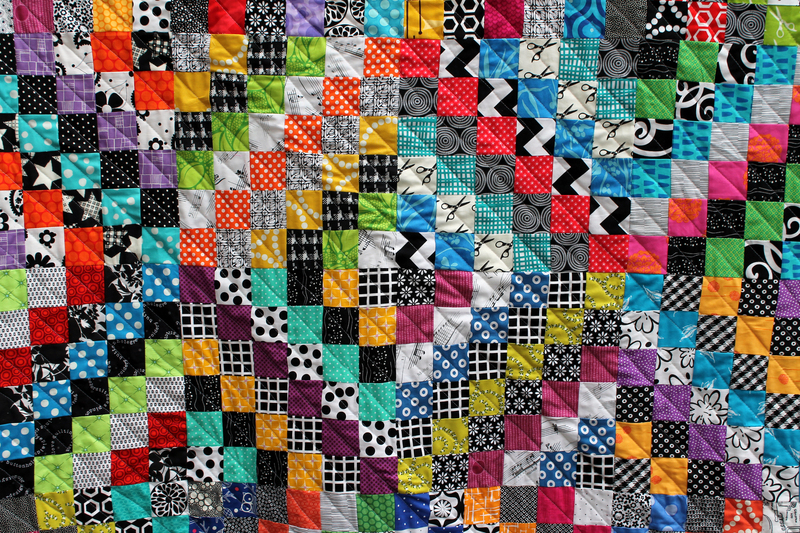 Lots of black & whites mixed with loud obnoxious colours makes for a fun quilt. I backed the quilt with some Ikea fabric, did some diagonal quilting and machine bound it. I had never bound anything with solid black before but I think it works well with this quilt. I am digitally adding my Trip to the growing collection out there on the web and then sending the real thing off to Project Linus for some one to snuggle under. 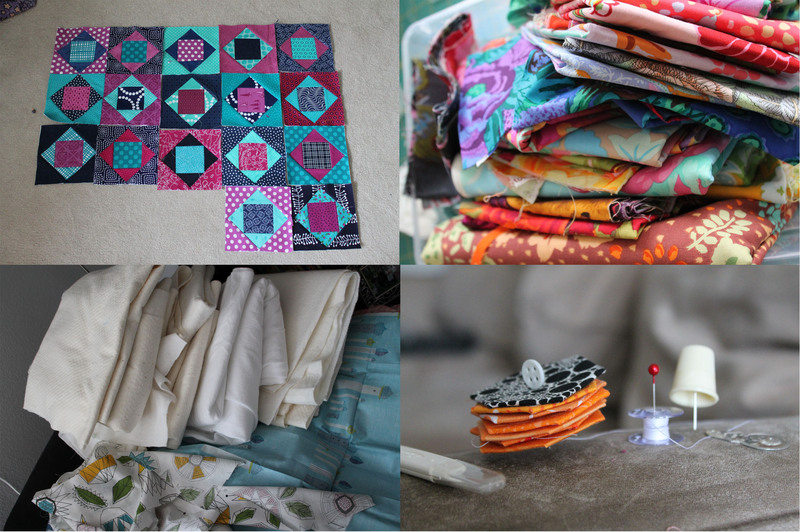 And in the spirit of Trip Around… here is visual trip around my quilting space (also known as our Living Room) as it looks this morning. That is… wip on the floor… fabric on the table waiting to be cut…. batting waiting to be used…. and my hexies work station on the couch/sofa arm. Yes I am a messy quilter. Nicely put. I will be borrowing that phrase. Beautiful trip around the world. I am a messy quilter too – there is no containing it! I am obsessed with your scrappy trip along – I think black and white/obnoxious colors are perfection! This is another stunning project – thanks for sharing! 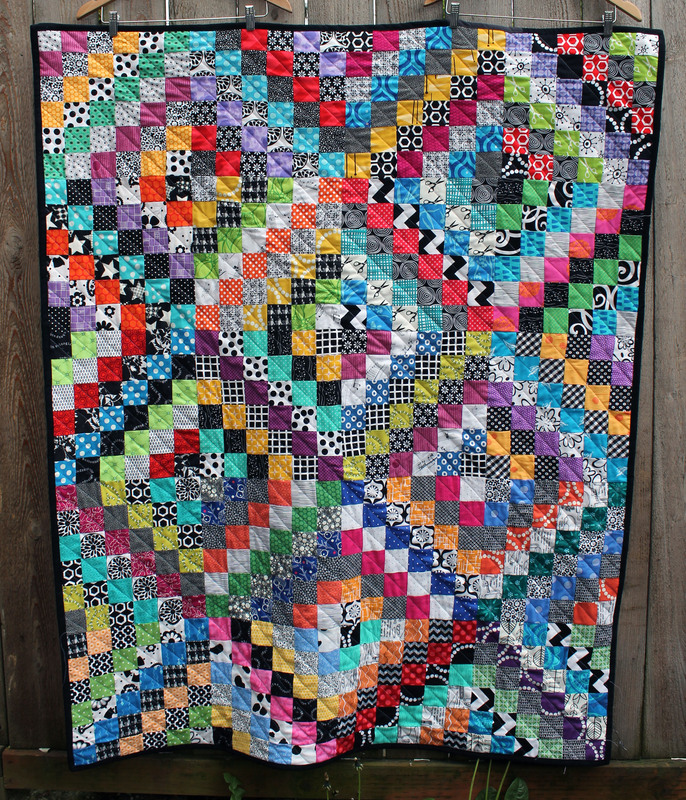 I love this quilt . Thank you for sharing! I am a messy quilter too. Stuff just piles up by itself it seems. Lisa… my fabric has a mind of it’s own as well…plus I think it is breeding… no matter how much I use I still seem to have too much!